A lot. The route that we follow every day gives us the chance to explore different areas of Athens. We see various neo-classical monuments and urban areas of the modern city of today but also hidden and famous ancient ruins that reflect the ‘Glory that was Athens’. Will we be entering the Acropolis on this walking tour? No. There is a separate ticket for archaeological sites and there are official tour guides that operate inside sites and museums. 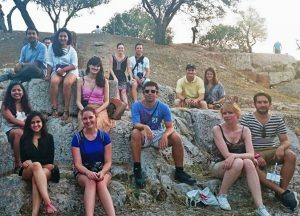 Our walk will be an ideal introduction to the city of Athens, so -if you’re on a tight schedule- be sure to factor some extra time to visit the Acropolis or the Agora. Not really. Just remember to carry a bottle of water. We suggest you wear comfortable walking shoes as sometimes we may have to go up a few steps. On hot days don’t forget your hat and also to put sunscreen on! How can I join the walking tour? Easy. Just hit the BOOK NOW link, we’ll reserve a free spot for you and we’ll send you all the details of our meeting point (the time & the place).